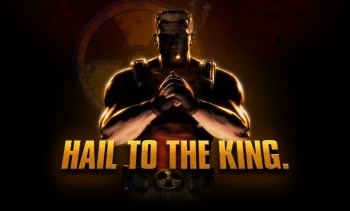 Gearbox honcho Randy Pitchford says it's "important" to release a demo for Duke Nukem Forever and now that the word is out, the studio can finally get on with making one. It's hard to say what the more common reaction was to the news that Duke Nukem Forever will finally (hopefully) see the light of day: Excitement at the prospect of actually, for-real playing it someday, or doubt that it could possibly be anything but a half-baked mess at this point. For any game that's been stewing for as long as DNF has, "good" simply won't be good enough. Making it even trickier for those on the fence will be the inevitable difficulty of sifting through the noise and hysteria that will almost certainly surround the game's release. What's a gamer with no particular interest in dropping 50 bucks on some ironic laughs to do? Pitchford has the answer: Try the demo, because yes, there's going to be one. "I think [the demo] is an important thing to do," he told VG247. "Now that the cat's out of the bag we can actually make those plans. Now we can get with retailers and figure out the launch window, and figure out demo timing, and work with the first-parties on that. We weren't able to do that until this point, because if we did we risked damaging it even further. " Noting that 2K hadn't even revealed the existence of the game to retailers until the day it debuted at PAX, he continued, "It's like making more promises. You know, even if the promise is real - which it is - people won't believe it until they see it themselves. We just wanted to bring it in front of people, and people will believe them, and we want more people to see it, because everybody needs to see it for themselves. That's important before it launches, and this is the first step." With all eyes on what could be the next Daikatana, putting out a pre-launch demo is a risky move but also entirely necessary. Things have changed dramatically since the last time Duke graced our presence and after 13 years of empty promises, disappointments and even a few screenshots, gamers have every right to demand a little something up front. Duke Nukem Forever is currently expected to come out some time in 2011 for the PC, PlayStation 3 and Xbox 360.